Almost all of the administrative tasks that I need to do there, such as submitting vacation days or joining a mailing list, are done through web applications. This is pretty typical of most offices these days. The problem that I have with all of these web applications is that just learning how to use them inevitably takes up time, and there are so many different ones. As a result, I end up spending a frustratingly huge amount of time figuring out all of the different applications. And most of the time, once I've finally figured out how to use an application, I don't end up using it again for a long time. But of course when I do need to use it again, I've already forgotton how! (And in many cases, I don't even remember the url of the system.) Then I have to figure out the interface of the system all over again. However, as you may have guessed, I have devised a way to use Taggabo to help me with this problem. Once I figure out how to use a system, I write in and log it in Tagaabo, with relevant tags. For example, let's say that today I figured out how to join a mailing list. 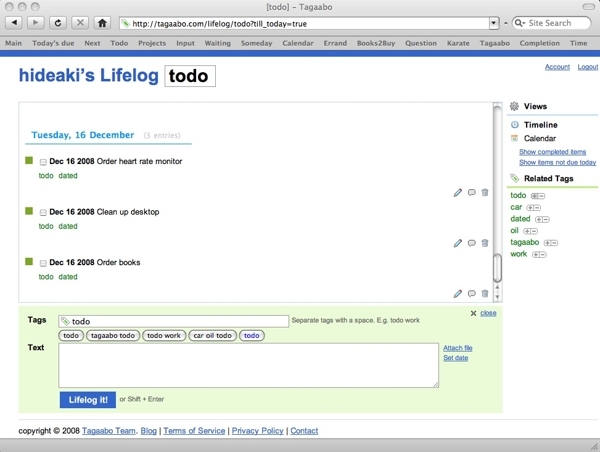 I write a quick description of the steps in Tagaabo and tag it with "mailing_list". Six months later when I need to join another mailing list and can't for the life of me remember how, I just type 'ma' in the search box of Tagaabo and I see that there is a "mailing_list" tag. When I select it I now have all the information I need to quickly and efficiently join a company mailing list. The same technique can be applied when you are learning anything. Nowadays, our complex modern lives require us to learn so many different things. Even if I've learned something new and feel that I understand it, if I don't think about it for a while or am busy doing something else, that knowledge can be difficult to pull recall. Tagaabo has been really helpful to me in these cases. I just type a related tag name in the search box and find memos that I have made for myself back when I first learned something. Even if it is just a short, tossed off note, the fact that I wrote it makes it easier for me to understand. It's much easier than deciphering the jargon of books or manuals. So get in the habit of recording the new things that you learn, and you'll be ahead of the curve. I think that every once in a while it is important to look back and reflect on what you have achieved. There are two important reasons for this. 1. It gives you encouragement and motivation to keep up the good work. When you see how much effort you have already put into something, you won't feel like giving up. 2. It can give you insight as to when you are accomplishing things and when you may not be. Armed with this insight, you can improve how you get things done. 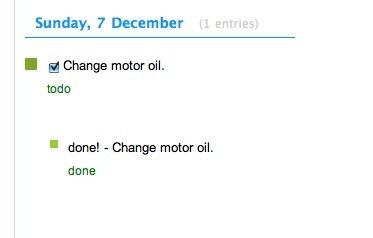 In Tagaabo, have you noticed that when you check off a To Do item, an item tagged with "done" is automatically created? 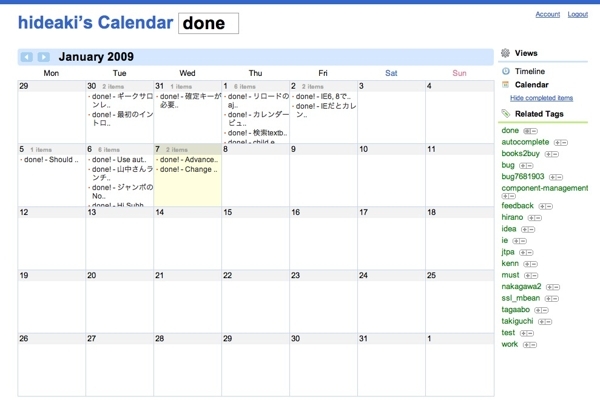 By looking at those "done" items in calendar view, you can get a sense how and when you have been getting things accomplished. By combining some other tag and the "done" tags, you can also see how you have been doing in a particular area. 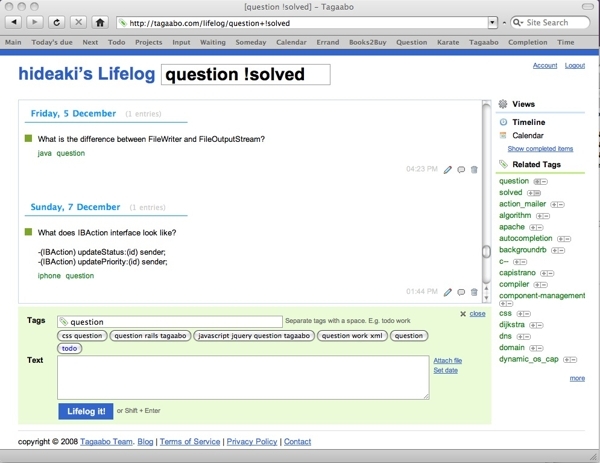 Here is how I have been getting things done on the development of Tagaabo. Tagaabo is especially useful when combined with your browser's bookmarks. I have a set of bookmarks for Tagaabo pages that I frequently visit and check. If you look up at the url for a page with any tag combination in Tagaabo, you can see that tag names like "todo" are included in the URL. And that means that if you bookmark that url, the bookmark will pull up the page with the combination of tags and other conditions (like view type--Lifelog or Calendar), that you want to view. Work related todo list. Sorry for no screenshot, but you got the idea. 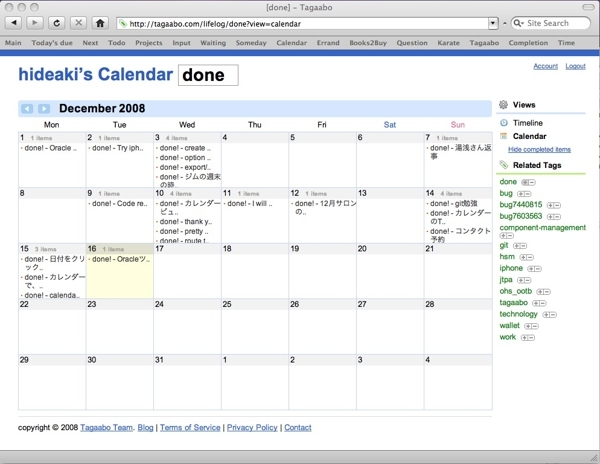 Also, this entry shows sets of bookmarks that are useful in implementing GTD on Tagaabo. If you have been using Tagaabo for a while, you may already have some useful bookmarks with your own original tag combinations. If you have such bookmarks, please share them with us. Just found this nice article on Tagaabo in Czech. It seems that the site is run by the publisher of David Allen's "Getting Things Done" in Czech. What pleased us most was that Tagaabo was introduced as an embodiment of "less is more" philosophy. You know what? That is exactly what we are trying to be! Thank you for the appreciation, Tomáš! Sometimes you find danger where you least expect it. I recently stumbled across an unexpected situation while I was programming. So when I program, I prefer to have a dark blue background for my editor because the traditional white background is too bright for me. I was staring at a particular line of code on the dark blue background, lost in thought. Next to my nice dark blue editor window however, there was a browser window that opened a page with a bright white background. Later, when I looked away from my monitor, I noticed that part of my vision was lost! It appears that my iris' were wide open because they were adjusted to the dark background of the editor, and the white light in the periferal screen was too strong and actually damaged my retinas. Fortunately, my vision recovered after about an hour, but I was extremely worried. When I have this kind of negative experience, I record it in Tagaabo with a "danger" tag. That way I can build up my "danger" database, so that I can avoid these type of situations in the future. By the way, there is a Japanese web site called "the failure knowledge database". It is a database of failures or accidents which has been compiled in order to help people avoid making the same mistakes. 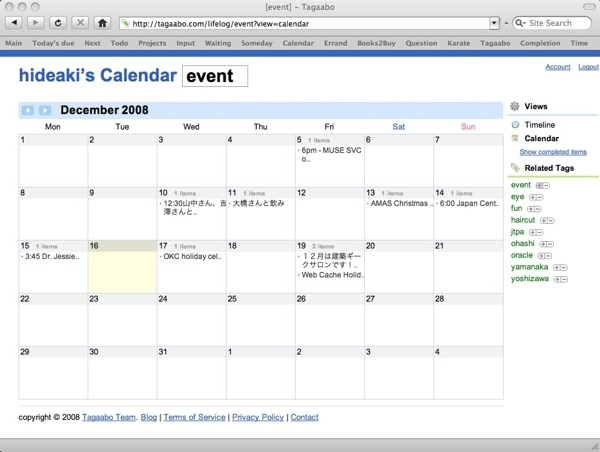 This page is in Japansese. But even if you don't speak Japanse, the illustrations can make sense. 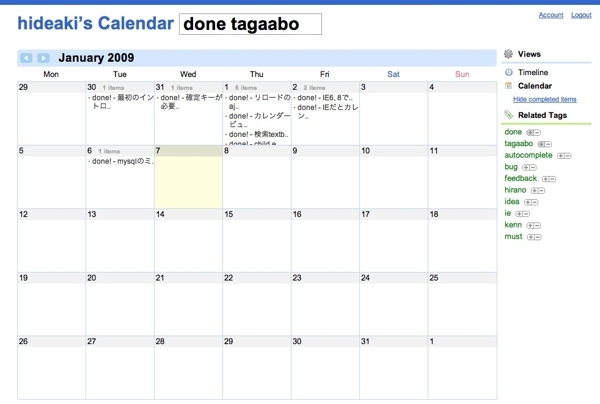 I use Tagaabo to keep track of my personal projects. I create a tag for a project, and keep logging whatever comes up about that project under the same tag. For me, Tagaabo is a major project so I log everything related to it with a "tagaabo" tag. Later on when I want to review any activity on the Tagaabo project, I simply type in "tagaabo" and I can see exactly what's been going on. For any small project, this works perfectly. However, with a large project like Tagaabo, I found myself lost in a sea of items. There were simply too many entries! Going over all of your log entries can be useful in some cases, but often, you want to cut to the chase and see only what is current. So I realized that something like a Wiki could be really helpful. Here is what I do now. When I feel a project needs it, I create an entry with a "wiki" tag. For example, for the Tagaabo project, I have a few items that are tagged with both "tagaabo" and "wiki". Because you can easily edit Tagaabo entries just by clicking on the text, I keep updating those items with the latest status of the project--just like you would with a wiki. Whenever I want to review or update them, I simply type in "tagaabo wiki" and I can view just those Wiki-like items. Just wanted to let you know that we started to tweet what we are up to on twitter.